In the money @FoxwoodsPoker 600. 45/348 left. 10 min left in Day 1. Playing for $40K. 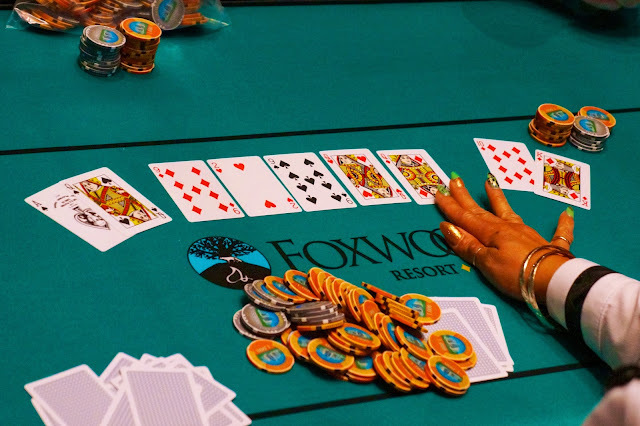 With just 12 minutes of play remaining on Day 1 of the $600 No-Limit Hold 'em event at the Foxwoods Mega Stack Challenge, the money bubble has burst. The 45 remaining players are now all guaranteed at least $1,113. Day 2 will kick off at noon tomorrow and will play down to a winner. We will be live streaming all of the Day 2 action. The blinds on Day 2 will be starting at 3,000-6,000 with a 1,000 ante. The average chip stack is currently 160,000 with 45 players remaining. Full Day 2 chip counts and seat assignments will be posted shortly after the conclusion of play. We had a total of 361 entrants in the $600 No-Limit Hold 'em Foxwoods Mega Stack Challenge. The final 45 spots will finish in the money with first place taking home $40,218. Level 5 of the $600 No-Limit Hold 'em event at the December Mega Stack Challenge just got underway. We currently have 262 entrants in the field with registration and re-entry open for another four levels. The blinds are currently 100-200 with a 25 ante and players start with 20,000 in chips. The December Mega Stack Challenge is now Underway! The December Mega Stack Challenge at the Foxwoods Resort and Casino is now underway with the start of the $600 No-Limit Hold 'em event. Players are starting with 20,000 in chips and registration and re-entry is available for the first nine levels of play. Levels 1-6 are 30 minutes in length, Levels 7-18 are 40 minutes and Level 19 and up will be 50 minutes in length. There will be a 10-minute break after levels 3,6,9 and 15 with a 60-minute dinner break following Level 12. There will be 18 levels of play on Day 1. There is a $125,000 guaranteed prize pool on this event. You can view the full December Mega Stack schedule by clicking here.